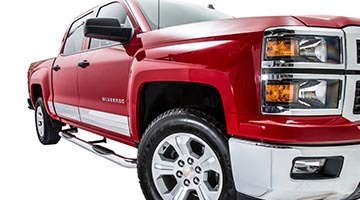 ICI Tubular Nerf Bars offer excellent quality and value at an affordable price! 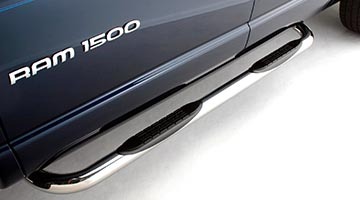 ICI manufactures these 3" tubular 16-gauge nerf bars to the most exacting standards, and they are available in either black powder coated carbon steel or hand-polished stainless steel finishes. They feature molded black plastic step inserts and no-drill installation for most applications. ICI's Polished Stainless Steel Nerf Bars come with a Limited Lifetime Warranty against manufacturer defects, and because they are made of high quality stainless steel, they will not rust like other lesser quality bars. The fit and finish is impeccable, and they're priced to offer tremendous value for the money! The new step pad gives an extra 6 inches of stepping area. 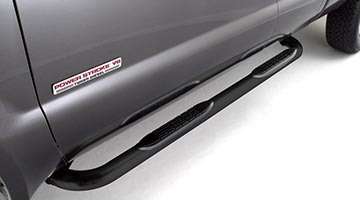 Protects rocker panel area from body damage. Gives the vehicle a custom look and style. The high-quality 304 stainless steel tube protects against rust and corrosion. 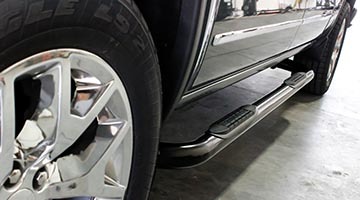 Our full-length sidebars offer you the same great quality with an extra step at the front of the bed for easy access to your cargo or toolbox. ICI's unique polishing process give our sidebars a chrome like mirror finish that is second to none. ICI Bars are made from, the highest quality 16gage 304 stainless steel 3in tube. Our newly redesigned molded plastic step pad allows for a better grip and a nicer finish. All ICI bars are a no-drill application for ease of installation. Our sidebars are custom Engineered to fit, for maximum ground clearance, a practical step and a great look and fit. ICI has a wide range of applications to fit most domestic and import's.